The Windows registry is a directory which stores settings and options. NT Registry Analyzer contains information and settings for all the hardware, operating system software, most non-operating system software, users, preferences of the PC, etc. Installing/uninstalling/changing software, hardware and drivers never leaves a PC clean. Use NT Registry Analyzer to find and remove incorrect or obsolete information in the registry. Free tool to find incorrect or obsolete information in the registry. ...... The registry also provides a window into the operation of the kernel, exposing runtime information such as performance counters and currently active hardware. Some software and hardware developers use outdated or incorrect installation processes that fail to remove all references to the application or hardware when it is either installed or uninstalled. Uninstalling or changing software, hardware and drivers never leaves a PC clean. Entries are left behind in the computer registry causing the PC to become unstable and corrupted. This results in sudden crashes, system failures and unknown error messages that ultimately cause a severe lag in the PC's performance. Scan your Registry for possible problems and fix them. 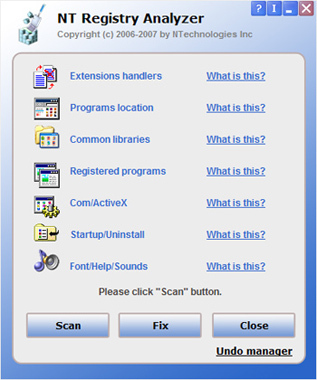 Clean and fix problems of your Windows registry. Qweas is providing links to NT Registry Analyzer 1.0 as a courtesy, and makes no representations regarding NT Registry Analyzer or any other applications or any information related thereto. Any questions, complaints or claims regarding this application NT Registry Analyzer 1.0 must be directed to the appropriate software vendor. You may click the publisher link of NT Registry Analyzer on the top of this page to get more details about the vendor.